The immune system has evolved to recognize and destroy pathogens. Invasion by extracellular microorganisms is mainly controlled by B lymphocytes which, using surface immunoglobulins (Ig) as receptors, recognize antigens in their native conformation either free in solution or on the surface of cells. Invasion by intracellular parasites is mainly controlled by cytotoxic T lymphocytes (CTL), which recognize foreign protein antigens on the surface of infected cells by a highly specific receptor and lyse the cells. Both CTL and B lymphocyte responses are specifically enhanced by lymphokines released by antigen-specific T helper cells. Unlike Ig, the T-cell receptor of both CTL and T helper cells does not recognize native proteins but it recognizes a binary complex formed by the association of peptides, derived from degradation of target proteins, with class I and class II molecules encoded in the major histocompatibility complex (MHC). Processing of target proteins occurs through two distinct pathways. Exogenous proteins are degraded in an endolysosome compartment, which intersects the biosynthetic pathway of MHC class II molecules (Neefjes et al., 1990). 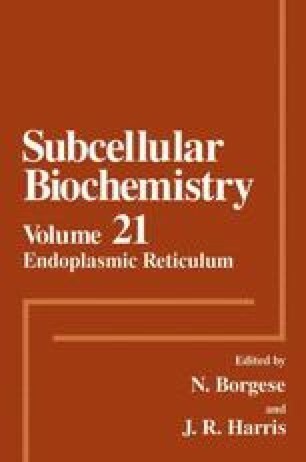 Thus, peptides derived from degradation of endocytosed proteins bind to MHC class II molecules. Newly synthesized proteins are degraded in the cytosol, and peptides generated from them are transported into the endoplasmic reticulum (ER) where they associate with MHC class I molecules. This review focuses on the latter pathway dealing with processing and presentation of intracellular proteins.